The Odd Couple has been remade and ripped off so frequently that it’s hard for anyone from my generation (or younger) to appreciate how good the movie (based on Neil Simon’s play) really is. The Odd Couple survives as a meme, but it has become a caricature about opposites living together — to the point that there was an animated remake featuring a cat and a dog. Yet the “opposites” idea has very little to do with the movie. Obviously it’s a great comedic setup, but the movie takes that as its starting point, not its focal point. Felix and Oscar are well matched, not mismatched. Sure, one is tidy and one is a slob, but that’s a complementary pairing, not an explosive matter/antimatter situation, at least as performed by Lemmon and Matthau. The proof is in the 11 films that they went on to make together after The Odd Couple (they were first paired in The Fortune Cookie). They are not just buddies; they love each other. As Lemmon’s son Chris says repeatedly in the DVD’s special features, there was a sort of magic between them that you can’t quite pinpoint — some sort of chemistry that just worked. That’s the relationship that was cemented in The Odd Couple. If you’ve never seen it, add The Odd Couple to your list. It’s a solid, entertaining comedy. ... but you don’t necessarily need to add this version of the DVD to your list. The Centennial Collection celebrates the 100th anniversary of Paramount studios. They’ve put out some very good titles under this label, but they’re not all consistently outstanding. In fact, the extras on The Odd Couple are probably worse than most. 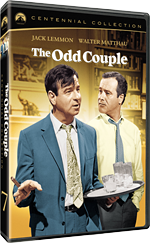 Unlike To Catch a Thief, also released under Paramount’s Centennial Collection today, the extra features on The Odd Couple disc are non-essential. The sons of Lemmon and Matthau are featured prominently, and occasionally they’ll interject an anecdote that makes you smile. But as often as not they simply marvel at the chemistry, the talent, or the kindness of their “pops”. The audio commentary features both sons. I withstood about an hour of it, and after the third time Lemmon the younger said that there was no way to explain the magic, I stopped letting him try to explain it. The featurettes are little better. Larry King, to whom publicists turn when no reputable critic will give a good blurb, adds his light weight to the set. In contrast, To Catch a Thief has a smart, well-prepared academic on board. Also appearing are Charlie Matthau and Chris Lemmon, who repeat what they said in the audio commentary, this time on camera. Even the visual presentation of the interviews is bad. The talking heads have been fuzzily matted onto a black background that makes you wonder what sort of production mistake is being covered up. Compared to the dense and meaningful information on To Catch a Thief, the extras on The Odd Couple are not worth your time. The Odd Couple is essentially a filmed play, so except for the theme song by Neal Hefti, there’s not much to tax your home theater. Watch the movie. Skip the extras.